In large bowl cream together your sugar and butter until fluffy. Mix in your eggs and vanilla until combined. Add in your flour, baking soda and cornstarch and mix until combined. Mix in your peanut butter until smooth. With spatula, fold in your oats, chocolate chips and M&M's. By heaping tablespoonfuls (2 per cookie) place dough onto cookie sheet. Bake for 13-15 minutes or until slightly golden on top. 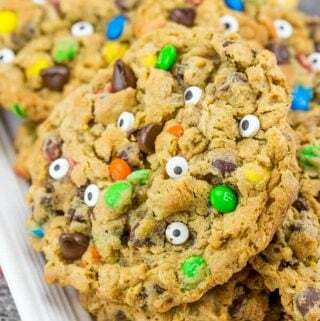 Remove from oven and gently press candy eyes onto warm cookies. Let cool on pan for about 5 minutes then transfer to cooling wrack to cool completely.